APR is managed by a strong expatriate team and uses experienced PNG researchers, including social science graduates lead by UPNG experts. Andrew Rose grew up in East Africa but is British by birth, education and inclination and has over 18 years of research experience in PNG. Andrew's focus on commercial applications of his Psychology/Sociology background has led to extensive experience in marketing and social research in developed and emerging markets in fields as diverse as fmcg, durables and capital goods through to the media, health and social and humanitarian issues. Andrew has long been a full member of ESOMAR. 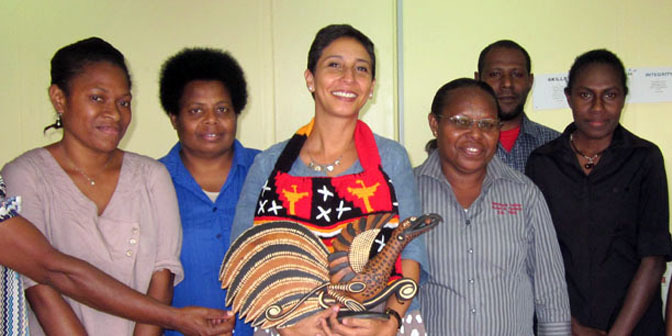 Mariana has over ten years' international experience working in PNG, Fiji, Kenya, Tanzania, France, Mexico, The Netherlands and Brazil. During this time Mariana has designed, led and published a wide range of policy and program assessments and impact research studies in the public sector. Mariana has extensive and relevant national and international experience in successfully conducting quantitative, qualitative and mixed methods impact evaluation research. APR's core team of supervisors are mostly UPNG Social Science graduates with many years of experience using our methods. They are bright, resourceful and multi-skilled with experience in all aspects from quantitative supervising to moderating qualitative work. Their fieldwork requires travel all over PNG, enhancing their local knowledge and extensive networks on the ground in the provinces. Walter and Rosa are senior lecturers in Psychology and Social Sciences at UPNG and have worked as qualitative specialists with APR for over 12 years. Samson is a prominent academic at the Solomon Islands College of Higher Education and consults to NGO development partners; he has also worked with APR for many years.